Hi everyone & Happy New Year! I just got back from the Christmas holidays where I tried (mostly in vain) to stay offline as much as possible. 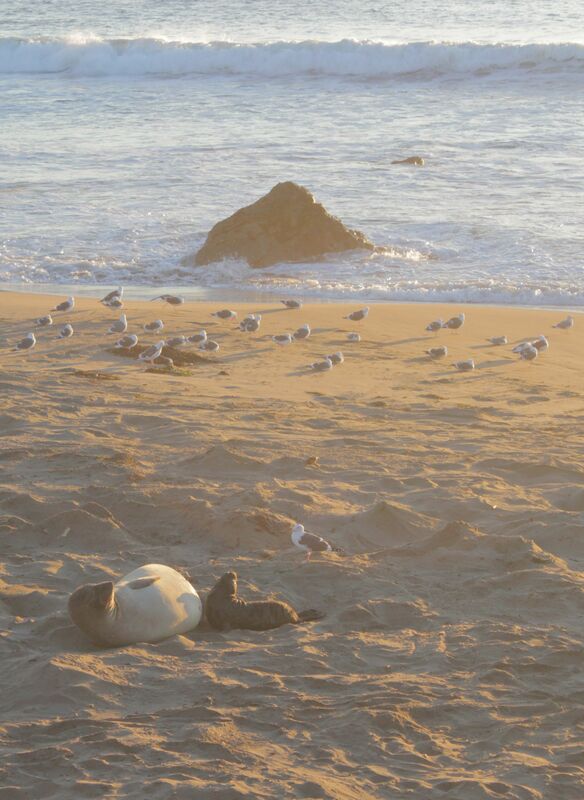 Newborn elephant seal at sunset. Did you know seagulls will eat mama seal’s placenta? Nature, nothing wasted. Damn all those vacation rentals and their easy Wi-fi 🙂 But it was good to get away – we drove down the California coast, saw some nature and lots of seals, sea lions, otters and stars, absolutely amazing stars at night. And even though I’d made a California playlist for the drive, we ended up listening to the radio most of the time. Which pretty much meant classic rock and modern pop. So my kids now know who CCR is, and I know that Avicii is like, one guy from Sweden. We also watched the New Year’s Eve countdown shows, in which Miley Cyrus threw down the entertainment gauntlet by fondling a female dwarf in gold lame. Let’s see Lady Gaga top that! So herewith is my second installment of the Year in Review, in no particular order, heavy on strong female voices. Hoorah! Tessanne Chin’s version of ‘I Have Nothing’ on The Voice reaffirmed my belief in the power of a pop song. Whitney would be proud. Tessanne, you are golden. Bieber & his moustache. You can do it, sweetheart – Movember is only ten months away! Critics’ Darling that’s actually kinda boring: Vampire Weekend. Unexpectedly awesome in concert: Belle & Sebastian, Dirty Projectors. Robin Thicke is that Dad with the hands that you had to watch out for when you were a babysitter. What do Kanye West and Woody Allen have in common? They’ve both lost touch with the real world. If you want to hear something cool, check out Lo-Fang’s single, ‘#88’. Debut album out soon. Atoms for Peace is Pepsi to Radiohead’s Coke. You drink it anyway, but only because they’re out of Coke. Pharrell Williams’ sweet, disarming face totally hides his pervy nature. Whoever chose the Eddie Vedder/Pearl Jam songs for the TV show Castle is the MOST AWESOME PERSON EVER. The best singer-songwriters today aren’t American or even Canadian. They’re Brits: Laura Marling and Jake Bugg. One of my favorite things about 2013 was listening to Miranda Lambert and Pistol Annies. Super duo: Edie Brickell & Steve Martin. There was more fresh, original music coming out of country and alt-country than the alternative/rock scene. Discuss. Eminem is now 40. Can an angry rapper age gracefully? This could be interesting. One day I’m going to listen to that Arcade Fire double album all the way through. But probably not ’til EO goes off to college. The sad thing about Miley Cyrus is that she made us forget what a great voice she has. New NCIS-LL Cool J crossover hit: ‘Grandmama Said Knock You Out’. I know I’m supposed to say Breaking Bad, but what I really like are Arsenal games and Castle. Still the coolest person in the room: Aimee Mann on Twitter. The Great Gatsby, The Wolf of Wall Street. Please can we stop with the all-soundtrack ADHD movie? It smacks of artistic desperation and well, laziness. Embrace the cliché: 2013 was the Year of our Lorde. That is all.